On the heels of their sophomore album, Indomitable, Leaders has a good problem: they may be too heavy. Poignant lyrics from the track “Hell.” Leaders’ new album, Indomitable, starts off with this, then grabs you by the arms and shakes. 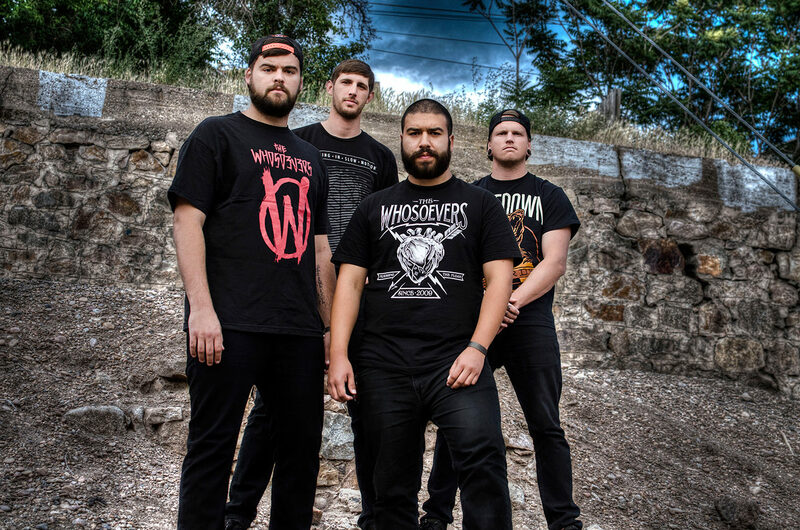 I spoke with Leaders’ vocalist, Lazarus Rios about his proudest moments, his lyrical process and how he coped with one of the hardest times in his life. Were there any reservations about writing the lyrics to “Hell”? Actually, I had the whole CD done before the studio when we were touring with Altars. We talked about how I wanted to say things in a way I hadn’t done before, so I sat down in the studio, and I just started writing and I didn’t hold back anything. So many bands say what they want and they don’t care what anyone thinks. I just wanted to write what I wanted to write without caring what people think about what I have to believe. So when you finished “The Outsiders’ Tour,” did you go into the studio with ideas for the entire album? We started writing (Indomitable) in September of last year, then we lost some members. I still do a majority of the writing and I was the original guitar player, so we actually wrote our first song in November 2012. We were done in May 2013, and then went on tour with Altars. Which track represents your proudest moment as a musician? That’s a hard one because we put a lot into writing all the lyrics and the music; we didn’t just throw parts together. The last song on the album because we had a guest vocalist from Altars, and I tied in that track with the last track on our first album; I tied together the way they ended. Which track represents your proudest moment as a Christian? “Nightmares,” because it’s about demons and stuff like that. It is one of those songs that says, “Satan you have no power.” I say, “I’m grabbing these demons by the neck and ripping them apart.” My parents are both pastors, so I learned that demons really have no power and that you just have to pray them away. I keep seeing the word “crossover” in reference to Leaders. What kind of crossover do you think they mean? I think it’s musically, how we went a lot heavier than the last record. We may lose some fans because we went so heavy. Would you explain the track “Pharisaical”? Basically, we are talking about people who think they are better than everyone else. We are all serving the same God, and we are all in this together. It’s not like I’m more of a Christian than you are; we are all still here to help each other out. Why are you named Leaders? We named one of our songs Leaders and (subsequently) changed our name to it. It was fitting because we felt we wanted to be leaders to people, just to help guide others along the way. Not to sound like we think we are better, but just to help guide others along the way. We try to hold ourselves to a higher standard. We are not just a band that says, “Hey, Jesus loves you,” and that’s it. We really try to build relationships with people. How is the band feeling about the upcoming release of Indomitable? We are really, really excited. We went through member changes, and this has been one of the most solid line-ups we have had in the last six years. Me, Jonathon and Josh wrote almost a song a day. We kept the ones we felt were really good. There were no egos and no one got angry; it worked really well. It was the easiest writing experience I’ve ever had in my life. Why do you want people to buy Indomitable? Because a lot more was put into it this time around, as far as thought and writing, as well as musically and lyrically. We want people to hear what we have to say, and we want to open the door to getting them to understand what we believe and what we are about. We are not here to condemn anyone, though, just to tell people to give what we believe a try. Kind of like when you have a painting that’s a masterpiece and you want to show everyone what you have done. Please tell me about the phenomenal cover art. We gave Dave Quiggle an idea of what we wanted, and then we told him he had free reign. It’s crazy; I don’t know how he does it. We haven’t changed one thing artistically. My parents have been the most supportive parents I could ask for. My dad bought me my first bass, and they got me into music. Touring is very difficult at times, but if you love it and would do anything to do it, then give your abilities and talents to God and give everything. My parents have given everything they have to be pastors. I mean everything. It is something that I saw growing up, and it’s something that has stayed with me. My dad always told me to follow my dreams ever since I was a kid. They have always been there for me through changes, from me wanting to give up to me playing in front of thousands of people. The support they give me is more than I can even imagine. Well, when I was in the studio working on this album, we lost our house. I rewrote all of the lyrics during that time. I really had a lot of questions to God about why it was happening, (so) this album is about everything I was going through. I really learned to trust God. I don’t feel worried about what to do tomorrow I know that He is taking care of everything. I have nothing to worry about. That is when I started to regain my focus. I was pretty much homeless when I was writing. Then, when we toured, the kids would come up to me and say that the lyrics touched them and wanted to know more. Some kids would say they didn’t believe what I believed, but they liked that I stood for something. It’s pretty crazy how God works. It’s not logical, but it works. Leaders was posted on September 3, 2013 for HM Magazine and authored by Collette Wycoff.